After 10 years, the mainstream media continues to pretend there are no valid questions surrounding 9/11. We are still supposed to ignore all evidence and common sense and believe that 19 deeply religious Muslim fundamentalists committed an incredibly daring martyrdom operation of coordinated plane hijackings and mass suicide, for no conceivable benefit to their cause. We are supposed to not ask the fundamental question that any competent investigator must ask — that of “Cui bono” — who benefits from this crime. Or for that matter, who — with the benefit of retrospective — definitely did NOT benefit. We are supposed to believe that these al-Qaeda terrorists accidentally brought more death and destruction than ever before to their Muslim brethren whom they were supposedly acting on behalf of, by bringing the wrath of the infinitely superior force of the US military upon their nations. We are supposed to believe that these terrorists deemed it worth to trade a few thousand “enemy” lives for millions of Muslims in their lands — the predictable American “retaliation” having been inescapable to these terrorists who already saw America as “the great Satan,” a demonic entity that has killed Muslims everywhere. Or, alternatively, we are supposed to believe that they had the intelligence and skills to pull off such a daring operation, yet didn’t anticipate the vastly disproportionate response the bloodthirsty, criminal, terrorist regime that they hated so much would unleash upon their favorite country (Taliban-ruled Afghanistan). We are told “Al Qaeda” and Osama bin Laden himself admitted responsibility, but it isn’t true. Osama issued several denials of responsibility, suggesting that Zionists may have been behind it, and he never made any confession in videos, as commonly claimed. We are supposed to believe the hijackers evaded authorities for years but then suddenly began to leave a long paper trail, using credit cards on their own names. They also engaged in un-Islamic behavior (alcohol, pork, cocaine, strippers, cursing God — every possible un-Islamic behavior!) that devout Muslims about to carry out a martyrdom operation would not do. The lead hijacker, Mohammed Atta, barely reached the airport in time for the flight, then packed no less than two bags on his final suicide trip, but the bags failed to make it on board, allowing the FBI to find operational details including the identities of all of the hijackers — allowing them to announce “case solved” on the same day of the attacks. We are supposed to believe that, once on the planes, the hijackers waited for far too long to hijack them, allowing — under normal circumstances — the NORAD and Air Force defense systems plenty of time to intercept the planes. They turned off the transponders, disabling communications with Air Traffic Controllers on the ground, then somehow managed to find their targets unassisted, a feat that professional pilots wouldn’t dare. And the absurdities go on. Beyond the alleged hijackers, we are supposed to believe in all manner of ridiculous explanations, such as that the complete bungling of the air defenses can be explained by incompetence alone — that it’s nothing but a series of innocent coincidences — as were the hijacking exercises and war games, and really everything else that contradicts the official conspiracy theory of the 19 magical Muslims. We are supposed to take on faith the probabilistically preposterous idea that two buildings could collapse straight down in the exact same way after only being hit by relatively small aircraft and having office fires burn for a short while. We are supposed to dismiss as irrelevant the fact that the WTC complex was privatized just before 9/11 and that the owner/leaseholder of the WTC buildings took control over security proceedings, and just so happens to be a personal friend of several Israeli Prime Ministers. We are supposed to dismiss the fact that Israeli Mossad agents were found all around New York City and New Jersey that day and after, that the only ones arrested on that day by local police and FBI were some of these Israeli agents working for a Mossad front company (Urban Moving Systems), and that the media didn’t report these facts more than once. A local media or on-scene correspondent for major media reports the incidents once, then they vanish from the airwaves and print, never to be heard of again — and we’re supposed to dismiss this as insignificant! Were it not for the Internet (and video sites like Youtube that made uploading videos easy) we wouldn’t have been able to confirm that Israeli agents tried to blow up the George Washington bridge on 9/11, something that would have multiplied the chaos and destruction. Prior to their arrest, an unidentified person called 9-1-1 and told Jersey City police about a Palestinian/Arab bomb-maker driving toward the Holland Tunnel: “a white van, 2 or 3 guys in there, they look like Palestinians […] a minivan heading toward the Holland tunnel, I see the guy by Newark Airport mixing some junk and he has those sheikh uniform […] He’s dressed like an Arab.” The mystery caller prompted the police to close off not only the Holland Tunnel, but also the other bridges and tunnels connecting New Jersey to Manhattan (specifically the Lincoln Tunnel and the GW Bridge). According to local media, the 5 Israeli men were detained around 4:30 p.m driving eastward along Route 3 in East Rutherford in an “Urban Moving Systems” van, very close to the Lincoln Tunnel on the New Jersey side. They were reportedly “carrying maps linking them to the blasts,” and when inspecting their van, “bomb-sniffing dogs reacted as if they had detected explosives.” They also had box cutters, $4700 in cash stuffed in a sock, and their foreign passports. Perplexingly, Israeli media reported the van being detained to the GW Bridge, which is about 10 miles away from the Lincoln Tunnel. The precision of these reports suggest that there may have been two different vans stopped: one on a ramp leading to the GW Bridge with 2 Israelis arrested, and the other near the Lincoln Tunnel with 3 Israelis arrested; or, alternatively, with 5 Israelis arrested in each van. An even stranger police radio transmission has an officer speaking of “a big truck with a mural painted of [an] airplane diving into New York City,” this white van actually exploding in King Street between 6th and 7th in NYC, close to the Holland Tunnel. Two unidentified “Middle Eastern men” were arrested when trying to flee the scene. The reports of truck bombs on 9/11 were so widespread that some thought truck bombs were used inside the WTC towers. 9/11 hero William Rodriguez and other eyewitnesses from inside the towers say explosions occurred in the basements moments before the first plane hit — could these explosions have been truck bombs? Two days after 9/11, three more Israelis were arrested by police in Plymouth, Pennsylvania with “detailed video footage” of the Sears Tower (the tallest building in the U.S. and arguably the 3rd most significant landmark building after the twin towers). They also possessed “maps of the city [of Chicago] with certain places highlighted.” The police were alerted by locals reporting illegal dumping of furniture by a tractor-trailer, labeled “Moving Systems Incorporated.” The driver, Moshe Elmakias, told police he had come from New York for a furniture pickup job, but when further questioned was unable to “provide a name or telephone number of the customer.” Another of the suspects, Ayelet Reisler, “had a German passport in her name and medication in a different name,” according to police. 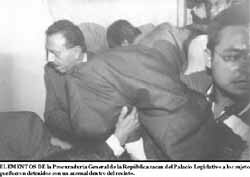 On October 11, exactly 1 month after 9/11, 2 Zionist terrorists were arrested with pistols, grenades, high explosives, and detonators, inside the Mexican Congress building (Palacio Legislativo de San Lázaro). The terrorists were identified as Salvador Guersson Smecke, a colonel with the Israeli special forces, and Sar ben Zui, an Israeli illegal immigrant. CNN reported the story once, promising to bring more details, but the story was never heard of again on American TV. The story apparently disappeared even from the Mexican media after a few days. Crucially, El Diario de Mexico revealed that the two Zionist terrorists had fake Pakistani passports on them, confirming that it was a false flag operation in which Muslims would be blamed for the terrorist attack. The terrorists were soon released and shipped to Israel after pressure by Israel and an emergency meeting between Mexican Secretary of Foreign Affairs Jorge Castañeda Gutman (reportedly Jewish), the head of the Mexican Justice department General Rafael Marcial Macedo de la Concha, Elías Luf of the Israeli Embassy, and a top Ariel Sharon envoy. The Mexican Congress incident is extremely significant, for it is a clear-cut case of Israeli agents trying to frame Muslims for terrorist attacks that they themselves were going to commit. Some 6 weeks after the “5 Dancing Israelis” (and GW Bridge would-be bombers) were detained, it was reported that Deputy Secretary of State Richard Armitage, criminal lawyer Alan Dershowitz, and two unidentified “prominent New York congressmen” were lobbying heavily for their release. Despite repeatedly failing polygraph tests, at the end of November 2001, they were flown home to Israel for no other reason than “visa violations.” They later said on Israeli TV that their “purpose was to document the event,” apparently without elaborating. On May 7th, 2002, yet another suspicious moving van was stopped by police, this one in Oak Harbor, Washington near the Whidbey Island Naval Air Station. Carl Cameron of Fox News reported that the van was pulled over for speeding shortly after midnight. The passengers told the police they were delivering furniture, but because it was so late at night, the police weren’t buying the story. A bomb sniffing dog was brought in and the dog detected the presence of TNT and RDX plastic explosives in the truck. The driver and passenger, both Israeli nationals, were (as with all the others) held on “immigration violations” rather than as terrorism suspects and soon shipped to Israel at the expense of American taxpayers. A majority of them served in “military intelligence, electronic signal intercept, or explosive ordinance units” — exactly the kind of background needed for parts of the 9/11 operation — an incredible “coincidence” that defies belief. That’s “Israeli spying” — not to speak of Israeli involvement in terror attacks against the U.S. that are blamed on Muslims! None of these 9/11 bombers and post-9/11 terrorists were CIA agents or US military personnel (and they certainly weren’t Muslims). They were agents of the one foreign government that benefited the most from the attacks. They were agents of the one foreign government that has the largest history of carrying out similar covert operations based on deception. They were agents of the one foreign government that somehow got away with attacking an American ship in international waters in 1967 and somehow getting the American government AND media to cover it up ever since! These reports should make any thinking person consider the possibility that 9/11 may have been an Israeli false flag operation. This is an excellent explanation by the ADL — I could not have put it better! The ADL could have added that it is also the form of terrorism that makes the most sense, and that Israel has admitted carrying out the King David Hotel bombing, the Lavon affair, and a few other smaller false flag operations. Could 9/11 have been an Israeli intelligence operation using a couple of angry and misled Muslim men to serve as the scapegoats? The best way to create a “legend,” or false identity trail, is to use real people who believe in the cause. Sow confusion by falsifying parts of their identities such as birth dates for those with common Arabic names, using stolen passports, etc, and you have not only a solid legend for American investigators to follow, but also a perfect diversion for the skeptics to focus on (“hijackers are still alive”). Since the trails lead to real people with friends and family, investigators would see no need to question initial assumptions which their investigations are based upon (such as “al-Qaeda” being responsible). All evidence seems to indicate this is the case, while evidence of direct CIA or US military involvement has failed to come up after 10 years. There is only evidence of Arabs (official) and Israelis (unofficial) being directly involved. Yes, this CIA official knew this and that FBI official knew that. Covering up their knowledge of the whereabouts of some of the alleged hijackers does not constitute evidence of direct involvement, only of following orders to “not interfere.” Nor do mere “connections” equal in importance reports by reporters on the scene reporting that truck bombs were stopped by astute police officers from blowing up bridges and tunnels on 9/11. “It’s been 10 years and we still don’t know who did 9/11.” This is a slogan that some 9/11 truthers insist on using. These 9/11 truthers would have us believe that, since we don’t know every detail of how it happened, we don’t really know who did it either. …then it is obvious that the most important objective of the 9/11 truth movement should be to find out made the air defenses fail and who rigged the buildings for demolition. The dramatic fate of the twin towers served as the main psychological weapon of that day, and the demolitions were also what killed the most people (more than 80% of the victims). Why would any 9/11 truther spend more time researching who did what and who knew that in the CIA or FBI or even White House, than who had the motive, means, and opportunity to plant the thousands of explosive devices necessary to demolish the buildings, and to create the conditions necessary to ensure the air defenses would fail to intercept the hijacked airplanes? A Coward Truther, that’s who. All roads lead to Israel, but the Coward Truthers, terrified of being labeled “anti-Semitic,” dismiss and try to avoid coming across this evidence, preferring instead to blame vague, unclear, unspecific entities — such as the “US government” or the “New World Order” — or hint at Saudi and Pakistani involvement. They would rather blame their own government in vague terms than blame a specific, tangible, identified group of people with a well-defined and long laid out ideological motivation which involves a foreign government. Yes, of course Cheney was “in on it” — it was precisely his gang of “shadow NSC” at the White House, staffed by Israel-firsters from PNAC and other Zionist think tanks (bypassing the more “American” Bush-Rice-Clarke-Powell official NSC and essentially controlling foreign policy), along with Israel-first neocons at the Pentagon who reduced the Pentagon’s role in counter-terrorism, who made sure Mossad’s “al Qaeda” false flag operation would succeed. To the Coward Truthers (and new truthers): make this the 9/11 year in which you ditch your irrational fear of being labeled anti-Semitic. It is the same smear as that other label that you are used to live with — it is its precursor, its older brother. Do your homework regarding the clear Israeli involvement, and join the real truth movement. Let’s make it what it should be: the anti-Zionist, anti-war, anti-globalization, anti-usury, 9/11 truth movement. On June 4th, 5 days after the attack, the IDF posted on Youtube a fake audio recording which has the flotilla activists saying “go back to Auschwitz” and “don’t forget 9/11”. 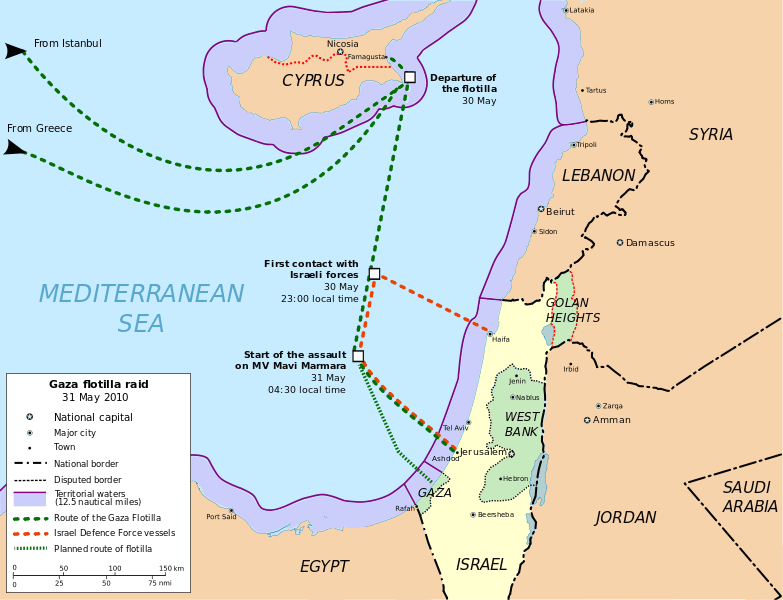 The IDF titled the tape Flotilla Ship to Israeli Navy: “We’re Helping Arabs Go Against the US, Don’t Forget 9/11 Guys”. The tape is so inequivocally doctored that it is probably a “deliberate mistake”, perhaps an attempt to make Israel seem incompetent at propaganda.